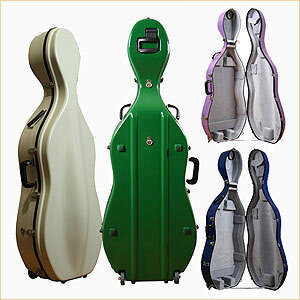 Bobelock cello cases remain the best made, best buy and most durable case in the world. Their workmanship and quality just cannot be beat. When buying a cello case, don't try to buy the absolute cheapest case on the planet. While it will look great when you get it and pull it out of the box, they often quickly fall apart or wear "hard". The Bobelock cases, made by American, Steven Bobelock in the Philippines, are elegantly made and very attractive cases. Day in and day out, stay like new and made to really take a beating. No cheap (un-tested) hardware on these. They use imported handles and latches and just work....year after year. The most popular Bobelock cello case by far is their cello case, #2000 (with wheels). This case is their Work Horse! Dependable and made to last. It comes with nice, well made wheels at the bottom/back so that players can easily pull the cases behind them. This is so much healthier for cellists, young and old. Anyone that has been playing the cello for anytime can attest that it is not much fun having to carry the cello and case around a few blocks before a rehearsal or concert. We rarely, if ever, have any problems of wear or premature breakage with Bobelock cases. They have won "Best of" (Strings Magazine) almost every year the past several years! You'll notice that we don't have the usual drop down menus for our instrument cases (offering different colors and combinations). This is because the with amount of business we have, the stock is constantly changing and it is a pain to constantly change the stock inventory in our shopping cart pages. We almost always have the color in stock, but it's easier for us to check when you call. Our customers appreciate our personal touch this way and are never disappointed. This way, we are current and you will get your case immediately after you order it. Please call us, 800-600-2689. For USA domestic shipments, FREE SHIPPING! 4/4 cello case interior dimensions: upper bout 13 3/4" - lower bout up to 17" - interior length 51.5"
Exterior colors: Black, Blue, Ivory, Red, Green, Pink!, Purple and Yellow. Interior colors: Blue, wine, tan, grey and green. 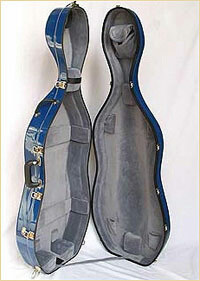 Bobelock Slim-Line Cello Case #2002, without wheels and "slimmed" down and lighter, to fit in your car! 4/4 cello case interior dimensions: upper bout 13 3/4" - lower bout 17" - interior length 51.5"
The Bobelock Slim-Line Case, #2002 is perfect for those that still want that Bobelock quality, dependability and affordability (we still offer the lowest prices on these too!) This case is for those that insist on keep their cello close to them (carrying) with no wheels, more compact, and something that will hold up nicely over time. 3/4 Sized, Bobelock Fiberglass #2000, Cello Case with Wheels "slimmed" down and lighter, to fit in your car! A lot of folks just use a padded cover for their 3/4 cello, but the hard case is a good selling point for the cello someday (when moving up to the full size.) The kids tend to have lots of accidents with cellos and gig bag (covers!) 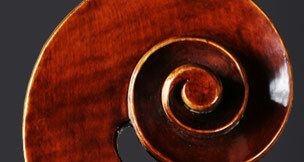 Getting a hard case, makes good sense, especially for cellos that are made from solid wood (not plywoods). Exterior colors for 3/4 size: Black, Blue or Ivory. 4/4 cello case interior dimensions: upper bout 13 3/4" - lower bout up to 18" - interior length 51.5"